The following directions are for the print book only. Since this is an e-Book, record all answers and self-evaluations separately. The diagnostic test is designed to help you pinpoint your weaknesses and target areas for improvement. The answer explanations that follow the test are keyed to sections of the book. To make the best use of this diagnostic test, set aside between 1 and 2 hours so you will be able to do the whole test at one sitting. Tear out the preceding answer sheet and indicate your answers in the appropriate spaces. Do the problems as if this were a regular testing session. When finished, check your answers against the Answer Key at the end of the test. For those that you got wrong, note the sections containing the material that you must review. If you do not fully understand how to get a correct answer, you should review those sections also. The Diagnostic Test questions contain a hyperlink to their Answer Explanations. Simply click on the question numbers to move back and forth between questions and answers. Finally, fill out the self-evaluation on a separate sheet of paper in order to pinpoint the topics that gave you the most difficulty. Directions: Decide which answer choice is best. If the exact numerical value is not one of the answer choices, select the closest approximation. Fill in the oval on the answer sheet that corresponds to your choice. (1) You will need to use a scientific or graphing calculator to answer some of the questions. (2) You will have to decide whether to put your calculator in degree or radian mode for some problems. (3) All figures that accompany problems are plane figures unless otherwise stated. Figures are drawn as accurately as possible to provide useful information for solving the problem, except when it is stated in a particular problem that the figure is not drawn to scale. (4) Unless otherwise indicated, the domain of a function is the set of all real numbers for which the functional value is also a real number. For the Diagnostic Test, practice exercises, and sample tests, an asterisk in the Answers and Explanations section indicates that a graphing calculator is necessary. Reference Information. The following formulas are provided for your information. 1. A linear function, f, has a slope of –2. f(1) = 2 and f(2) = q. Find q. 2. A function is said to be even if f(x) = f(–x). Which of the following is not an even function? 3. What is the radius of a sphere, with center at the origin, that passes through point (2,3,4)? 4. 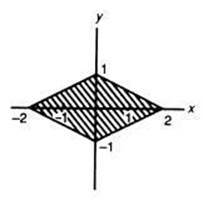 If a point (x,y) is in the second quadrant, which of the following must be true? 6. The average of your first three test grades is 78. What grade must you get on your fourth and final test to make your average 80? 9. How many integers are there in the solution set of | x – 2 | ≤ 5? (E) f (x) cannot be determined because x is unknown. (E) This expression is undefined. 14. If f(x) = 2x – 1, find the value of x that makes f(f(x)) = 9. 16. Given the set of data 1, 1, 2, 2, 2, 3, 3, 4, which one of the following statements is true? (E) The relationship cannot be determined because the median cannot be calculated. 17. If , what is the value of ? 18. Find all values of x that make . 21. If a and b are the domain of a function and f(b) < f(a), which of the following must be true? 22. 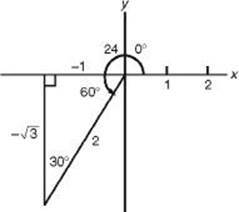 Which of the following is perpendicular to the line y = – 3x + 7 ? 23. The statistics below provide a summary of IQ scores of 100 children. 27. In how many distinguishable ways can the seven letters in the word MINIMUM be arranged, if all the letters are used each time? 28. 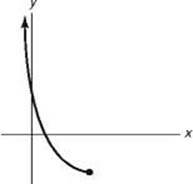 Which of the following lines are asymptotes of the graph of ? 29. What is the probability of getting at least three heads when flipping four coins? 31. In the figure above, S is the set of all points in the shaded region. 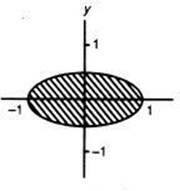 Which of the following represents the set consisting of all points (2x,y), where (x,y) is a point in S? 33. 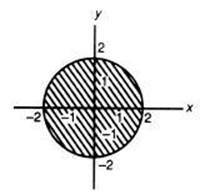 What is the length of the major axis of the ellipse whose equation is 10x2 + 20y2 = 200? 34. The fifth term of an arithmetic sequence is 26, and the eighth term is 41. What is the first term? 35. What is the measure of one of the larger angles of the parallelogram that has vertices at (−2,−2), (0,1), (5,1), and (3,−2)? 36. If for all nonzero real numbers, for what value of k does f(f(x)) = x ? 37. For what value(s) of k is F a continuous function? 39. If , what is the value of f –1(15)? 40. 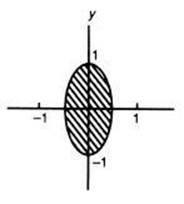 Which of the following could be the equation of one cycle of the graph in the figure above? 43. Observers at locations due north and due south of a rocket launchpad sight a rocket at a height of 10 kilometers. Assume that the curvature of Earth is negligible and that the rocket’s trajectory at that time is perpendicular to the ground. 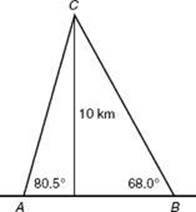 How far apart are the two observers if their angles of elevation to the rocket are 80.5° and 68.0°? 44. The vertex angle of an isosceles triangle is 35°. The length of the base is 10 centimeters. How many centimeters are in the perimeter? 45. 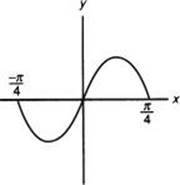 If the graph below represents the function f(x), which of the following could represent the equation of the inverse of f ? 46. If k > 4 is a constant, how would you translate the graph of y = x2 to get the graph of y = x2 + 4x + k? 50. A certain component of an electronic device has a probability of 0.1 of failing. If there are 6 such components in a circuit, what is the probability that at least one fails? If there is still time remaining, you may review your answers. The following explanations are keyed to the review portions of this book. The number in brackets after each explanation indicates the appropriate section in the Review of Major Topics (Part 2). If a problem can be solved using algebraic techniques alone, [algebra] appears after the explanation, and no reference is given for that problem in the Self-Evaluation Chart at the end of the test. An asterisk appears next to those solutions for which a graphing calculator is necessary. 2. * (D) Even functions are symmetric about the y-axis. Graph each answer choice to see that Choice D is not symmetric about the y-axis. Properties of even and odd functions: Even + even is always an even function. Odd + odd is always an even function. Odd x even is always an odd function. 6. * (D) Since the average of your first three test grades is 78, each test grade could have been a 78. If x represents your final test grade, the average of the four test grades is , which is to be equal to 80. Therefore, . 9. 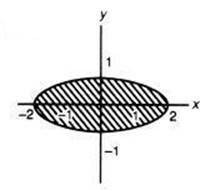 * (D) Plot the graph of y = abs(x – 2) – 5 in the standard window that includes both x-intercepts. You can count 11 integers between –3 and 7 if you include both endpoints. 11. * (C) Solve for y, and plot the graph of in the standard window to observe two vertical and one horizontal asymptotes. 12. * (C) Enter the given expression into Yt and key in TBLSET with TblStart = 0 and Observe Yt approach 0.5 as x gets larger. 17. (C) Multiply through by x to get x – 3y = 7x. Subtract x from both sides to get –3y = 6x. Divide through by 6y so that will be on one side of the equals sign. 19. 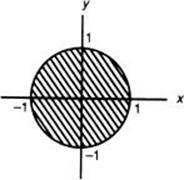 * (E) Plot the graph of y = abs((1/2)x2–8) in a [–4,4] by [–10,10] window and observe that the maximum value is 8 (at x = 0). 29. 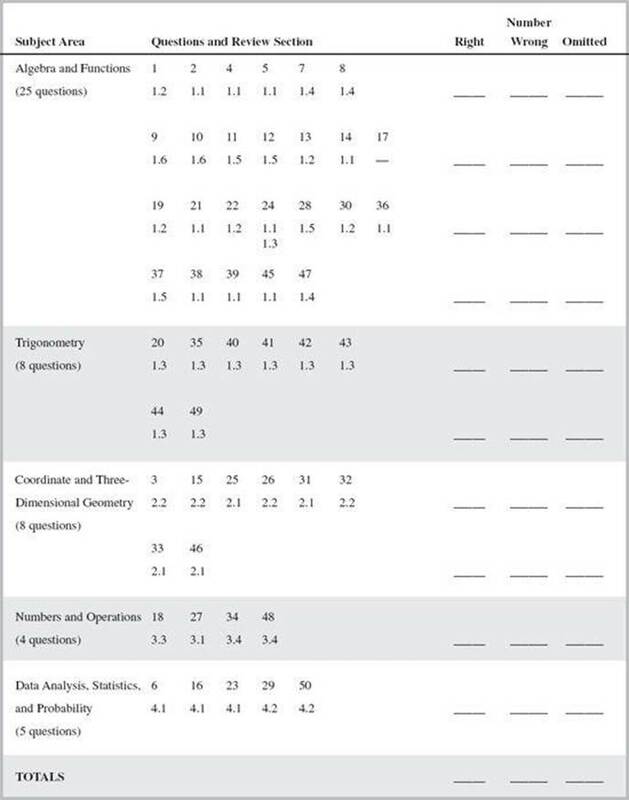 * (C) Since each of the 4 flips has 2 possible outcomes (heads or tails), there are 24 = 16 outcomes in the sample space. At least 3 heads means 3 or 4 heads. 37. * (D) Enter (3x2–3)/(x–1) into Y1 and key TBLSET. Set Indpnt to Ask and key TABLE. Enter values of x progressively closer to 1 (e. a. .9, .99, .999, etc.) and observe that Y1 gets progressively closer to 6, so choose k = 6. 40. * (E) Plot the graphs of all three functions in a by [–2,2] window and observe that they coincide. 41. * (D) With your calculator in degree mode, plot the graphs of 2(sin(x))2 – 3 and y = 3 cosx in a [90,270] by [–3,0] window and observe that the graphs intersect in 3 places. Always look for places throughout your solution where division by zero might occur. 43. 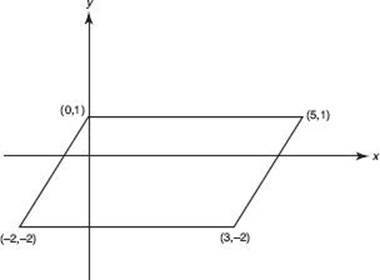 (C) The problem information is illustrated in the figure below. 49. 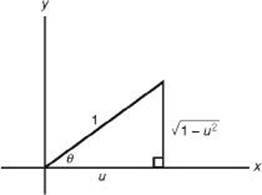 (E) Since , the figure below shows in Quadrant I with cos = u. 50. * (B) The probability that at least one component fails is 1 minus the probability that all succeed. Since the probability of one component succeeding is 1 minus 0.1, or 0.9, the probability that all succeed is (0.9)6 = 0.53, and 1–0.53 = 0.47. If R 44, S = 800.